It is not known exactly when the first cattle arrived on Tristan, but it was certainly in the very early days of the community in the early 1800’s. 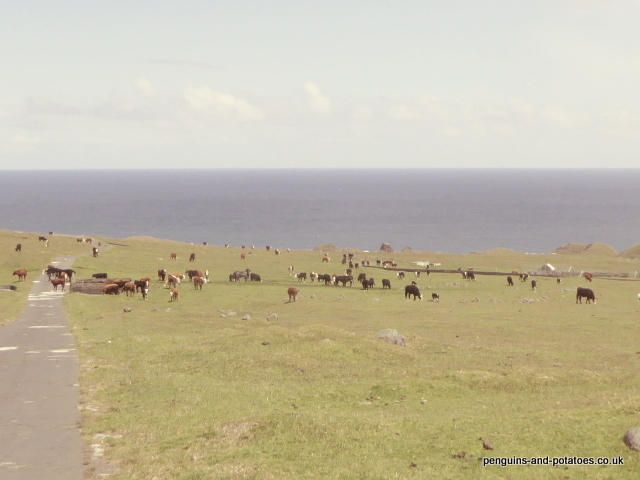 The Leader of the island then was Corporal William Glass, who had somewhat utopian plans for the structure of the social community which included shared ownership of all the island’s assets, including the cattle. However, this cooperative ownership idea was changed before long, and individual ownership was established. Some individuals built up quite large herds, and they profited by bartering the meat with visiting ships, in exchange for tea, flour, sugar, and hardware items. Overstocking rapidly became a problem, and cattle numbers were controlled by hard winters resulting in starvation and death. The worst year was in 1906, when numbers had built up to about 700 head of cattle, and the bad winter resulted in the death of around 360 individuals. Individual ownership of cattle remains to this day. Every household has a quota of cattle, and these cattle are largely run as a herd, with the Agriculture Department carrying out some of the services for the cattle, including health treatments, fertiliser and fencing of the pastures, and the provision of bulls and AI. However, because the cattle are all individually owned it is not possible for the Agriculture Department to make any of the all-important management decisions, such as the selection and culling of animals for genetic improvement, and such as limiting overgrazing by means of herd reduction. Efforts have been made in the past to improve the bad situation that had resulted from overgrazing. Back in 1975, a quota system was introduced, with each household being limited to 4 breeding cows. This was later reduced to 3 per household, and in 1983 it was reduced further to 2 per household. 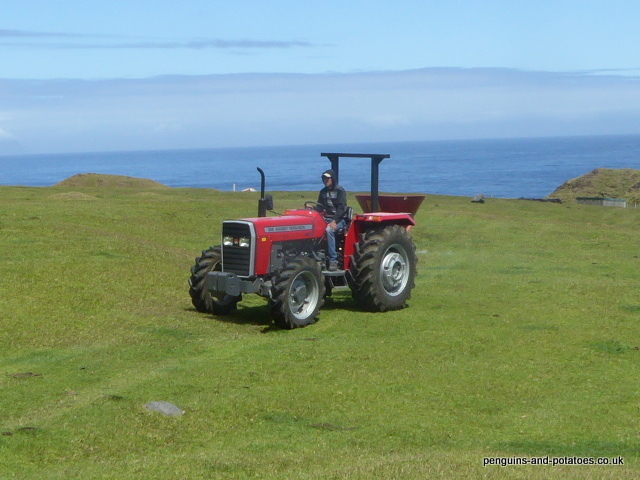 Overgrazing, on the scale found on Tristan da Cunha, has resulted in a circle of negatives. Cattle have been undernourished, and the poor growth rates have meant that steers go to slaughter at well below optimum weights, and are kept far too long in the herd before slaughter resulting in animals being on the pastures for too long, thus there are too many mouths to feed on a continuous basis. The cattle themselves have to spend far more time grazing than they should, and thus they spend too much energy in the grazing process. 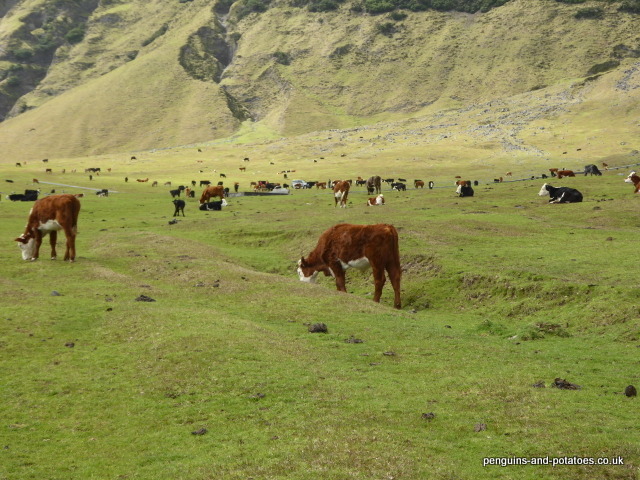 On Tristan, another dimension is that the fact that the cattle are having to graze grass that is too short means that they are grazing grass that is loaded with volcanic grit which is very abrasive, and which wears their teeth down at an unacceptable rate, this itself resulting in early death. Meanwhile, the forces of grassland ecology have progressively resulted in the surviving grasses being those that are adapted to growing very close to the ground – the grasses that try to grow upwards merely get chewed down as soon as they rise from the ground. Also, with so little leaf area, the overgrazed grass takes far too long to recover and to start growing again when the stock are moved to another pasture. To this whole process can be added the shortage of nitrogen fertiliser being applied, and a very low pH because of no lime being applied to the grasslands (resulting in very poor grass growth rates). Lifetime stunted growth in the cattle, and fertility problems, are two other consequences of poor nutrition. Altogether, the overgrazing has made the situation with both cattle and grass progressively worse, year after year. To this unhappy cycle you can add the effects of mineral deficiencies that are known to exist here, and a further dimension is the loss of roughly 10% of the grazing area as a result of the silt and rock slides that took place in the floods of April 2017. Nearly a year ago, I presented a report which went into great detail on the cattle crisis, and which listed some options that could be selected. This included the possibility of reducing the quota from two cows per household to one. The Department was obliged to carry out a referendum on the subject, which showed no public appetite for change. However, although the reduction in herd size was not at the time selected, the issue was widely discussed throughout the year, particularly when the condition of the cattle was visibly deteriorating. The matter came up to the Island Council once again just a few weeks ago, and the decision was made to reduce the quota from two cows to one. A brave and historic decision! The benefits of this decision will not be immediate. The action to halve the adult cow quota will not be effective until the end of March 2019, to give people time to select and cull the surplus animals. Bearing in mind that the adult cows make up only about one third of the total herd, it will then take three years before the reduction in cow numbers passes through to all the young stock. Thus we are looking at a four-year programme of cattle number reduction. Although there are very obvious economic and management benefits of greatly reducing cattle numbers and overgrazing, it is not possible to predict with any accuracy how the actual numbers will evolve. This is because it is a dynamic situation with many different factors involved. For example, the islanders may follow trends elsewhere in the world and reduce red meat consumption in favour of fish (which of course is plentiful here) resulting in a reduced interest in maximising individual ownership of cattle. Also, there is a declining human population on the island, hence there will be a decline in the number of households having a cattle quota. In addition, it can be expected that better grazing will result in faster growth rates, resulting in beef cattle reaching slaughter weight far quicker, so that at any given time there will be proportionally fewer young stock than is the case at present. This latter point is key – if the cattle reach slaughter weight quicker, they will be less time on the hoof taking all the costly inputs of medication, fertiliser, fencing, and so on. 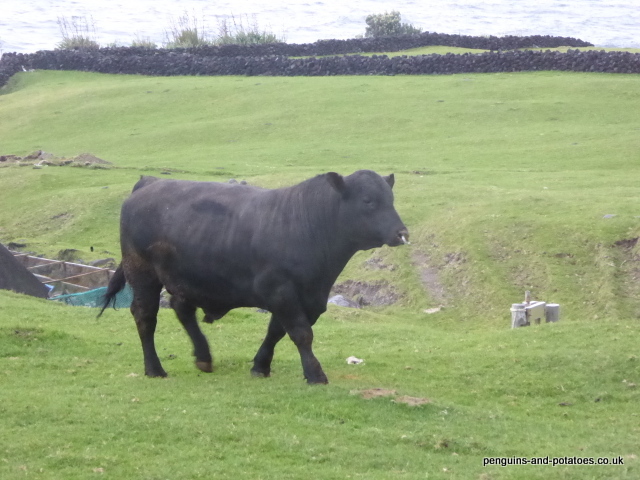 It is noteworthy that the two young bulls that arrived recently from South Africa, at 16 ½ months of age, were massively heavier than any of the island steers which are generally slaughtered at an average age of more than three years. This point was certainly not lost on the islanders, and the timing of the arrival of the new bulls, just a few weeks before the Island Council decision, was fortuitous in providing visual evidence! Around the community, the feedback I am being given since the Island Council decision is that “something had to be done”. It is interesting to reflect on the processes of debate and decision-making on the island. In brief, it seems that the ‘voice of the people’ is an essential element in the debate on important local issues, but that there is respect for the hard but sensible decisions that sometimes have to be made by the elected representatives on the Island Council. Great news, Well done Alasdair. 200 years of unproductive cattle farming on Tristan finally at an end. Now the islanders can look forward to tender juicy Aberdeen Angus steaks! I am just leaving advance notice that we will almost certainly have to discontinue the means to leave comments on the site. The trouble is that we have been receiving a vast number of comments that have nothing at all to do with the subject matter of this site. The majority of them are from US-based payday loan companies and car insurance brokers, but there are others too. They all take time to sort through and delete. If anyone can advise how to filter these out while keeping the genuine ones in – please advise! Otherwise, if you feel like posting a comment – do so soon, it may be your last chance!